This rope toy by Mammoth is the perfect fetch, tug, and chew toy all in one! Composed of a.. DESCRIPTION: These tough rope toys are great for tugging or throwing. Toys also help keep do.. 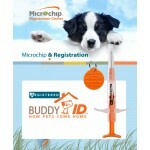 Microchip and Registration How Cool is this! One low price for: the Buddy-ID Min..